the buzz – Master Beekeeper since 1982 and still enjoying the buzz. One pound of honey……equals the life work of approximately 300 bees and a flight distance of two to three times around the earth. My bees are kept in safe and organic environments, to ensure the bees longevity and provide you with the purest honey available. I care passionately about my bees and quality honey. Should you consider keeping bees in urban areas? Since the 80’s honeybees and beekeepers have been on the decrease, on average 34% annually. Since 2006 this has been accelerated by the Colony Collapse Disorder. 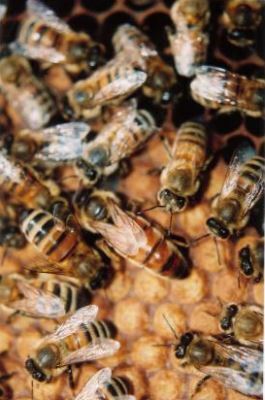 Although the Bees Act will not allow bees to be kept closer than 30 meters from a property line or 10 meters near a highway, there are many beekeepers who do! Why? Is the system antiquated? Are the laws outdated? Are there too many controls in society that need to be changed? Is there information being kept from the public eye? Ask questions and find out! One of the things I believe is needed in communities to address the decline is a Backyard Beekeeping Association (BBA). 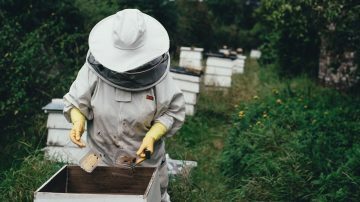 This does not have to be connected with any existing institutions, but could be grassroots; it should be focused on local education in communities, towns, and cities and on teaching new beekeepers (new-bees). Their are no by-laws restricting roof top beekeeping. 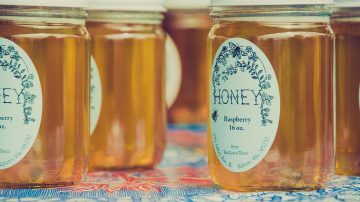 Caring for bees & a safer environment, Practicing Organic Beekeeping, Producing the best quality honey. Why we cannot call any Ontario honey “organic” according to the Canadian Honey Council: because bees fly more than a 2 mile radius, the Canadian honey council know their is no 2 mile radius of land in Ontario that is organic. Bees will collect nectar far and wide. Although I use no chemicals and keep my bees on organic farms and in safe environments the correct term which we beekeepers in Ontario can use is “Practicing Organic Beekeeping”. Do your part in keeping our environment clean do not spray your garden give all insects and bugs a chance they all play a role in life. For every pest their is a natural predator, biological controls are cheaper and more effective than chemicals, if chemicals were effective land owners would not have to repeatedly spray spray and spray again. Biological controls are more effective sometimes 100% effective, If Entomologist and Biologists got 1% of support and funding of Industrial agriculture have, the chemical industry would not have such a distructive effect on our planet and would be much greener for those who have to follow in the next generations. All products from the bee hive are known to have health benifits to some extent. Want softer home made cookies? substitute honey for some of the sugar called for in your recipe. Honey holds in moisture, so the more you use, the softer your cookies will be. To give yourself a moisturizing facial mask, combine 1 mashed avocado with 1 Tbs. honey. Spread over your face and neck. Leave on for 10 minutes; rinse with warm water. Honey is antibacterial !! rubbing a little over a cut or scrape before covering will promote faster healing. Below, I am with my bees. I presently manage approximatley 300 beehives from the City of Pickering to Hastings County. Over the next few years I'd like to increase my bee population to a minimum of 1000 beehives. 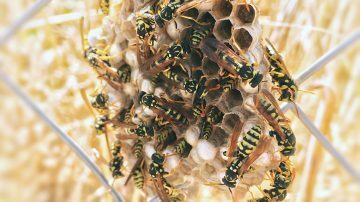 Bees play a major role in the food chain not only do they provide many varieties of food for humans, they also play a role in the foodchain for many varieties of wild animals and birds. Keeping bees alive in our society enhances everything around us. 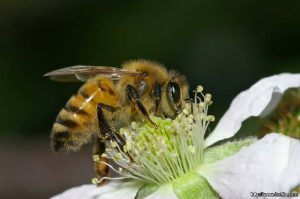 Bees pollinate many trees, bushes, and wild flowers that produce other fruits and nuts that we don't eat but birds, bears, mice, rabbits, horses, foxes, and many more animals depend on.